A striking new print and poster ad campaign for US cosmetics brand Glossier has been hailed after it featured stunning images of five very different and very naked women. The campaign for its Body Hero range – an an oil-based body wash and body lotion combo – features five women, all beautiful photographed and all from very different backgrounds. The women include plus-sized model Paloma Elsesser, retired basketball player and gold medalist (and heavily pregnant) Swin Cash Canal, Trialspark clinical research coordinator and influencer Mekdes Mersha, LPA clothing brand creative director Lara Pia Arrobio and founder of sportswear brand Outdoor Voices, Tyler Haney. 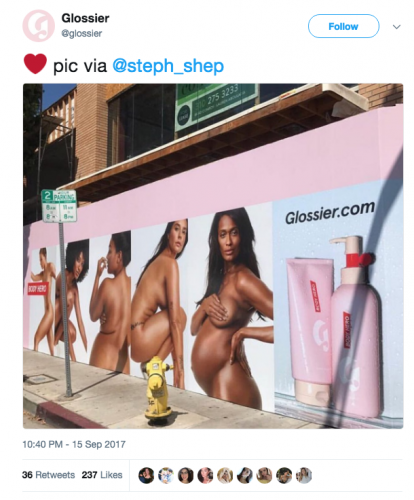 Glossier’s campaign features on its website and a blog, as well as its social channels and an outdoor poster campaign in New York and Los Angeles.